You have created an amazing challenge and you want to make sure all eligible advocates will be informed that it has been published. You can do this by sending a notification via email to your advocates. You can either send a challenge notification on the spot, or you can schedule the notification for a future date. 1. If your advocates have opted-out of notifications, they will not receive these notifications. We will discuss how you can check which advocates are not subscribed to email notifications here. 2. If you have not published a challenge, you will be unable to send a notification. While viewing the list of Challenges in your hub, you will see a pencil beside each of the challenges. Click on the pencil icon for the appropriate challenge. Click on Notify Advocates to send an email notification to advocates (see below). You can also send a notification while on the page for any challenge (see below). In this case, you can click on the blue Notify Advocates button which is above the challenge title. This page is where you manage the messaging, visibility and scheduling for your challenge notifications. View the picture below to find information on each component of this page. Note: Advocates who have opted-out of notifications will not appear unless you uncheck the box. If the challenge is currently published or scheduled, you will have the ability to schedule a challenge notification. 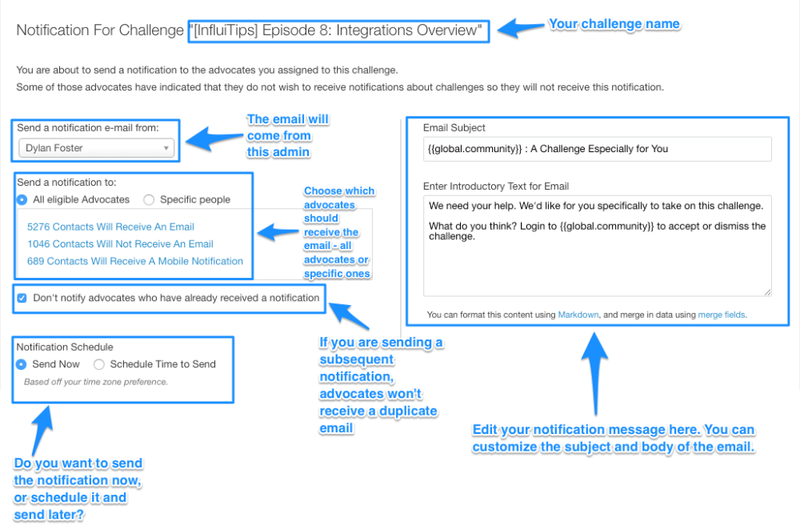 Do this on the challenge notification configuration page. Note that the scheduling options seen below will have different wording based on if your challenge is scheduled to publish or already published. 1. Send on Publication or Send Now - The notification will deliver as soon as you publish the challenge. If it is already published you can send it now. 2. Schedule Time to Send - Schedule any time in the future for your notification to be sent. Note: Notifications will only be sent for published challenges. If your challenge expires or a completion limit is reached, the challenge will become unpublished. Thus, notifications will not be sent. Notifications can not be sent for unpublished, unscheduled challenges. A challenge may only have one scheduled notification at a time. To modify the scheduled notification, you must delete the currently scheduled notification and schedule a new one. Notifications will respect the targeting rules which exist at the moment they are sent out. Thus, if you change the targeting after scheduling a notification, it will respect the most recent rules. When you get to the challenge notification page, you have the ability to check who will not receive the notification email and the reason why they will not receive it. When you click on 3 Contacts Will Not Receive An Email as below, you can see who those contacts are and why they will not receive it. The pop up window below is what you will see after you click 3 Contacts Will Not Receive An Email. As you can see, there are two main reasons why they will not get the email: Unsubscribed from challenge notifications or Previously Received This Email. 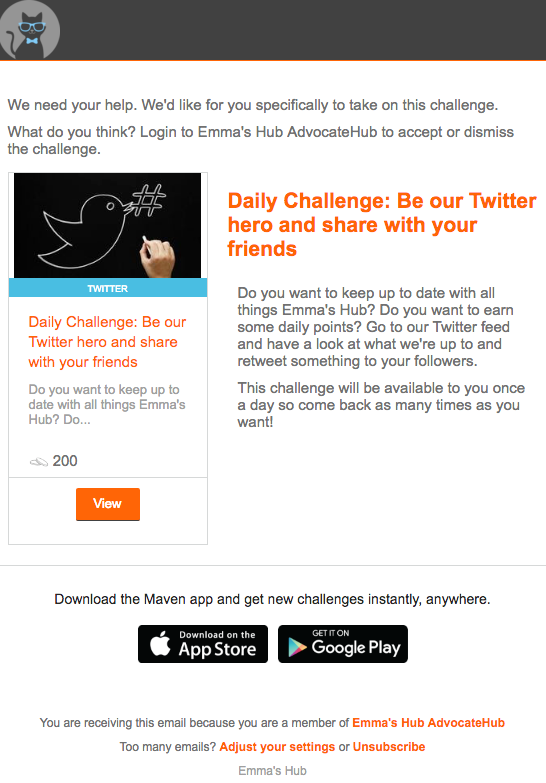 Previously Received This Email means that you might have sent out a challenge notification already. Those who have already received it will not receive it again. 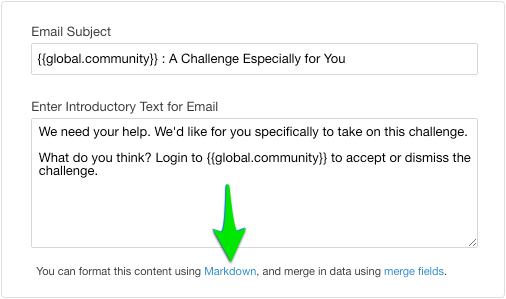 You can also preview this before sending to advocates by clicking on the Preview option on the Challenges Notification page.